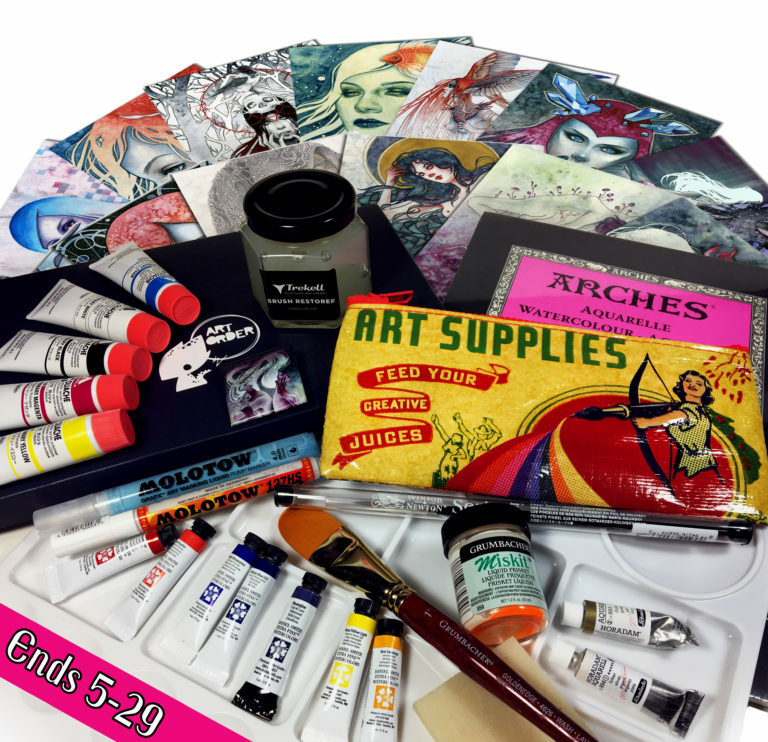 Kelly McKernan's Ultimate Art Giveaway! You guys. YOU GUYS. This feels insane to write, but I’m about to hit 200,000 likes on Facebook and I’ve just crossed 90,000 followers on Instagram! These numbers are so hard to imagine, but the evidence that y’all are real people and chose to support me is always there. I am so grateful for every kind and encouraging comment, every like, every share, and of course, every purchase made. Because of you, I’m able to celebrate 5 years as a full time freelance artist this month! Since I was a little girl, my dream was to grow up and be an artist. There was no other option, no other possibility for me. Growing up and into college, I kept that focus and set achievable short term and long term goals to grow as an artist. In school, I was told in my freshman year of college that only 1% of art students actually “make it,” so I thought, why else am I here? I’ll be a part of that 1%. While “making it” differs from artist to artist, all that meant to me was that I can make a living doing what I love. But one thing has become clear over the years: that I must also grow – constantly grow – as an artist. I’ll forever be a student, open to learning and trying new things! That said, over the years, I’ve been able to try a myriad of new materials, learn new techniques, and continue evolving as an artist. So, I’ve gathered all of my favorite art materials along with a few additional goodies, and one extra very special award: I will also do a portfolio review and give tips on the materials in a 1 hour video chat for the winner! A one hour video chat session for a portfolio review and tips and an explanation of materials included in the giveaway. To enter, check out the form below! The giveaway will end Monday, May 29th at 11:59pm PST.